Hockey Fans Score Goal for Endowment Fund! ABI hockey fans gathered last night for fun and fellowship at the first major 2016 charity event in support of the ABI Anthony H.N. Schnelling Endowment Fund at Philadelphia’s Wells Fargo Center. Supporters of the hometown Flyers left a bit disappointed when Matt Hunwick from the visiting Toronto Maple Leafs netted the game-winning goal with just 7.5 seconds left in the game, but everyone enjoyed the luxury suite generously donated by Gavin/Solmonese LLC, complete with food and open bar. In addition, the Endowment Fund received generous sponsorship from Becket & Lee LLP, Polsinelli, and Womble Carlyle. A grateful thank you to all the sponsoring firms, and to all the fans who came out for the event! Supporting and participating in Endowment events is a fun way for the insolvency community to help us achieve the Endowment’s goal of funding important bankruptcy research and educational activities. 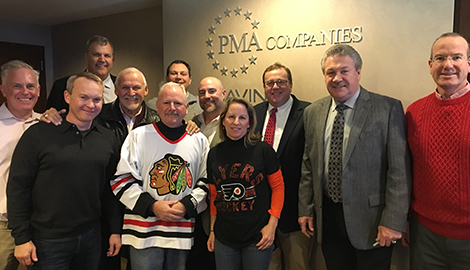 At left, fans got a chance to meet hockey greats Bernie Parent (fourth from left) and Dave Schultz (second from right). Pictured are, from left, Tom Horan (Womble Carlyle) Jim Van Horn (McGuire Woods), Dave Hohman (BMO Harris Bank), William Taylor (McCarter & English), Ted Gavin (Gavin/Solmonese — Endowment Fund VP–Development), Chris Ward (Polsinelli), Alane Becket (Becket & Lee), Paul Deutch (Rust Omni) and Kevin Mangan (Womble Carlyle). 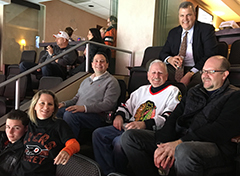 Above, some of the guests, including Bob Manolescu (right, from Wilmington Trust), enjoy the game. 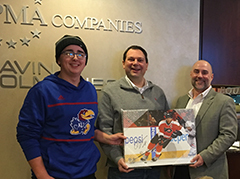 Below, Ted Gavin presented an autographed photo of Claude Giroux to auction winners Dan Scott (left) and Chris Ward. Get Noticed and Be Invited! ABI Members who pledge or contribute to the ABI Anthony H.N. Schnelling Endowment Fund at or above the Sustaining Member level ($2,000 and up) will be recognized during the luncheon and invited to an exclusive reception at the Annual Spring Meeting in Washington, DC (April 14-17). Donate online at http://endowment.abi.org/ or contact Kathy Sheehan (ksheehan@abiworld.org) for more information. Donations are tax deductible and can be paid over 5 years. Please consider signing up for our automatic monthly giving program! Gray Reed & McGraw, PC (Jason S. Brookner), Andrews Kurth LLP, Gardere Wynne Sewell LLP, and PDC Energy. A chapter 11 liquidating plan may provide that any unclaimed funds may be redistributed to a tax-exempt, not-for-profit, non-religious organization identified in the plan or disclosure statement accompanying the plan. The ABI Endowment Fund has been appropriately designated as the recipient of such unclaimed funds in chapter 11 cases, both large and small. For more information and sample language, visit http://www.abi.org/endowment/ways-to-give or contact Kathy Sheehan at 703-739-0800. Locke Barkley, Chapter 13 Trustee; Chip R. Bowles, Bingham Greenebaum Doll LLP; Law Office of Craig Geno; Selene Maddox, Maddox Law Office; Law Offices of John D. Morre, P.A. ; Walter Newman, Newman & Newman; Andrew Phillips, Mitchell, McNutt & Sams, P.A. ; Robert P. Reynolds, Reynolds, Reynolds & Little, LLC; Hon. Katharine M. Samson. single-site appellate moot court competition. A similar number are expected to compete this year. The competition takes place on March 5–6, with a Gala Awards Dinner on Monday, March 7, at the Sheraton New York Times Square Hotel. The Endowment Fund awards $5,000 to the first-place team, $3,000 to the second-place team, $1,500 to two third-place teams, and $1,000 each for Best Oralist and Best Brief. Final-round judge Hon. 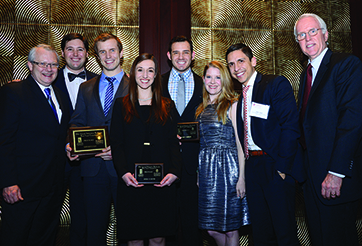 Michael J. Melloy (left) and competition director Prof. G. Ray Warner (right) are pictured with members of the 2015 winning teams from Southern Methodist University Dedman School of Law.